Minimum Prices on top of original sole build up. Larry Schupbach, the owner of Village Shoe Service became a certified pedorthist (C.Ped.) in November 2005. A pedorthist is someone who works with doctors to help people with foot pain using orthosis and proper footwear. Pedorthics is the design, manufacture, modification and/or fit of footwear, including shoes, orthoses and foot devices, to prevent or alleviate foot problems caused by disease, congenital defect, overuse or injury. Certified Pedorthist have studied lower extremity anatomy, pathology and biomechanics, as well as shoe construction and modification and foot orthosis materials and fabrication. Their qualifications have been tested and accepted by the American Board for Certification in Orthotics, Prosthetics & Pedorthics (ABC), and they participate in continuing education programs to maintain their certification. Certified Pedorthists are qualified to fit and dispense footwear according to prescription. Most footwear prescriptions are written by doctors. In several states, physical therapists, physician's assistants and selected other professionals are authorized to write footwear prescriptions. Apex Ambulator Biomechanical Footwear is designed to limit stress at the areas of the foot most susceptible to pain. Ambulator Biomechanical Footwear provides unsurpassed comfort and protection with unique features such as Hidden-Depth Rocker Soles, state of the art removable comfort orthotics and soft pigskin leather linings. 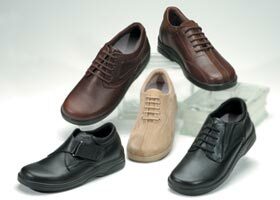 Ambulator Conform Footwear is a unique line of "off-the-shelf" shoes that provide total Plastazote protection along with other classic Ambulator features such as Hidden-Depth Rocker Soles and removable Conform Orthotics. Ambulator Stretchers are designed by a team of pedorthists and podiatrists to provide superior comfort and protection for the diabetic, arthritic or injured foot. Ambulator Stretchers include shoes, boots and sandals with features such as high toe boxes, seamless spandex uppers lined with Plastazote foam and Velcro straps. 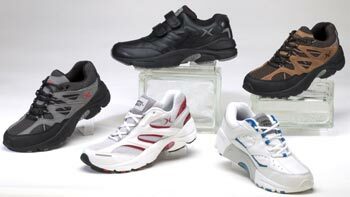 Aetrex Performance Footwear combines the latest developments in pedorthics with state-of-the-art shoe design. More and more people across the globe are experiencing the comfort and performance of Aetrex, wearing styles including hikers, cross trainers, runners and walkers. All Aetrex shoes are made from the finest materials available and offer a combination of stability, control and cushioning not seen in any other line. In addition, every shoe incorporates Aetrex's unique PRSÂ™ Insole, allowing you to easily customize the fit and comfort. Aetrex Performance Footwear provides an equal distribution of pressure throughout the gait cycle while maintaining the highest standards in comfort, breathability and overall support. With Aetrex Footwear you can continue to live life your way, enjoying the activities that you love most.